The tradition of the famous Peabody Marching Ducks began in 1932. Peabody General Manager Frank Schutt, an avid sportsman, and a friend Chip Barwick, returned empty-handed from weekend hunting trip in Arkansas. 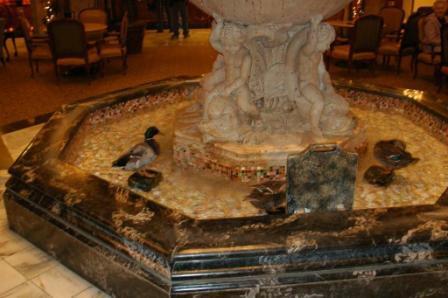 The two friends had a bit too much Tennessee sippin' whiskey, and decided to play a prank and put their live duck decoys (which were legal at the time) in the fountain in the hotel's Grand Lobby. Three English call ducks were placed in the fountain, and the reaction from hotel guests was nothing short of enthusiastic. Soon, five North American Mallard ducks would replace the original ducks. In 1940, Bellman Edward Pembroke, a former circus animal trainer, offered to help with delivering the ducks to the fountain each day and taught them the famous Peabody Duck March. Mr. Pembroke became the Peabody Duckmaster, serving in that capacity until his retirement in 1991. The late Mr. Pembroke's portrait hangs in the entrance to The Peabody, a luxury suite is named for him and a building in Peabody Place development is named Pembroke Square . In 2003, The Peabody Memphis conducted an extensive search for a new Duckmaster, garnering the attention of national media outlets such as CNN, the CBS Early Morning Show, and The Wall Street Journal. The Duckmaster is solely responsible for the care and wellbeing of the Peabody Ducks, including feeding, exercise, and training the teams for their daily march. Today, the ducks are housed in the "Duck Palace" on the hotel roof. 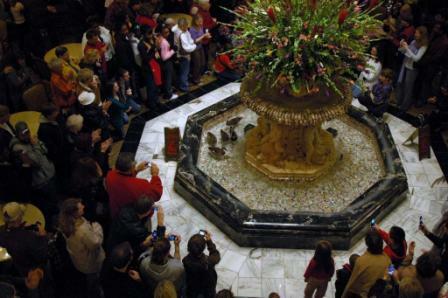 Every day at 11 a.m., they are led by the Duckmaster down the elevator to the Italian travertine marble fountain in the Peabody Grand Lobby. A red carpet is unrolled and the ducks march through crowds of admiring spectators to the tune of John Philip Sousa's King Cotton March. The ceremony is reversed at 5 p.m., when the ducks retire for the evening to their palace on the roof of the hotel. The Peabody's famed ambassadors are five Mallard ducks – one drake with his white collar and green head, and four hens with less colorful plumage. The ducks are raised by a local farmer and a friend of the hotel. Each team lives in the hotel for only three months before being retired from their Peabody duties and returned to the farm to live out the remainder of their days as wild ducks.